Sanding sticks come in very handy. But they can cost the earth if you need them in bulk. You can however make your own at low-cost and to fit whatever size you need. Paddle-Pop (Popsicle) sticks – available from the craft store. You can also use coffee stirrers, balsa wood, bass wood, pine, or anything else that you have laying about the place. Take a bunch of paddle-pop sticks and glue up one side only. 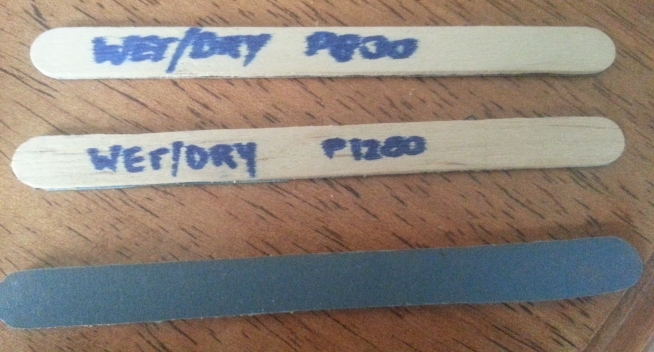 I write the type of paper and the grit on the back of each of my sanding sticks. This ensures that when you need it you can find exactly what you’ll need. Got some other ideas to share? Post a comment below to let me know.